We tabled a proposal for DiEM25’s German Provisional National Committee to circulate among our German collectives. They discussed the document, whenever possible took it to public gatherings, amended it, and most critically, reached out to like-minded Bundestag candidates to endorse and commit to enact if elected. This was in the same spirit as our French members approached their parliamentary elections last June. Germany rose to envy-of-the-world status thanks to a social contract that offered the working class strong protection (and seats on the boards of directors of large companies) if it conformed to a flexible rule-bound, free-market environment in which business could get on with it. In conjunction with local banks linked to differently sized industries, and in a positive global environment, the so-called “German economic miracle” unfolded. However, since the creation of the euro and the banking crisis it caused, German economic competitiveness has increasingly been bought at the expense of Germany’s social market model. The casualisation of many workers, the repression of wages, the doubling of the proportion of ‘working poor’ Germans, the Christian Democrats’ increasingly confident attempt to limit social spending and public investment – all these developments are quietly turning Germany’s social market model into an empty shell that only resembles what German social democrats had once thought they had achieved. Moreover, more ‘structural reforms’ that will further reduce the life prospects of millions of Germans are currently being tried and tested elsewhere in the Eurozone. Explain to the people of Germany that the (limited) achievements of the German model are under serious threat and that, moreover, the developments in the rest of the eurozone are enabling the dismantling of the German social market tradition. Defending and making necessary improvements to Germany’s social democratic institutions and model goes hand in hand with opposing the coalition’s policies in the Eurozone. Progressive German candidates are already ringing alarm bells across the Federal Republic, to warn voters of a gross and dangerous falsehood: the notion that Germany is doing well out of the euro crisis and that its leaders have shepherded the European flocks well and wisely during it. The reason is simply: precisely the opposite has been the case. Germany is much weaker as a result of the crisis and Europe is at an advanced stage of disintegration as a result of how the German government has mismanaged Europe’s social economy and its resources. Yes, it is true that the crisis has created a large surplus for the federal budget (due to the massive suppression of interest rates charged to roll over Germany’s debt) and a huge influx of capital into the Frankfurt banks (due to capital flight from weaker economies whose citizens fear Grexit, Italexit etc.) But these surpluses are a sign of weakness, not strength. They are the sign of massive current and future hardship for a majority of Germans. To have the German establishment celebrate them as indicators of economic health is to add insult to injury. When a country like Germany reports its lowest level of investment (as a percentage of national income) at a time when investors are paying its government to borrow and savings are at the highest level in the nation’s history… When that country’s elites insist that the various surpluses must be maintained through further wage repression of the squeezed German working class, as a means to undermine the French and Italian working classes and give an excuse to the French and the Italian governments to squeeze their own workers… When in a country like Germany everyone is a saver (governments, families and companies save more than they spend/invest), thus being forced to entrust their hard-earned savings to other countries that they must then control via austerity and threats… When an ageing country that feels a need to save for its future is creating the economic forces that push interest rates below zero, thus depleting its own savings… When all this happens, you know that the country in question is in trouble. Make German voters aware of one basic thing: We are all in this together! No country is ring-fenced from the crisis. Germany cannot hide behind its surpluses without crushing its workers and its pension funds. If our monetary union is in the grip of vicious imbalances, misery is shared between the weaker citizens everywhere – whether they live in surplus or in deficit countries. It is because we are all in this together, because there can be no solution for Italy’s or Greece’s problems that does not include an end to German mini-jobs, ‘uberisation’, underinvestment, etc., that Germany needs a European New Deal. Now, a majority of Germans have been convinced that a European New Deal means Germany paying for the rest of Europe. They are right to think that Germany is rich, but not that rich. However, they are wrong to believe that a European New Deal means German taxpayers paying more to fund the social welfare, investment projects and banking systems of the rest of Europe. To demonstrate this, and the way forward, DiEM25 has put together its European New Deal Policy Paper. Initiate a large social, political and cultural debate around the idea of a European New Deal, and use our European New Deal Policy Paper as a framework for this transformation. 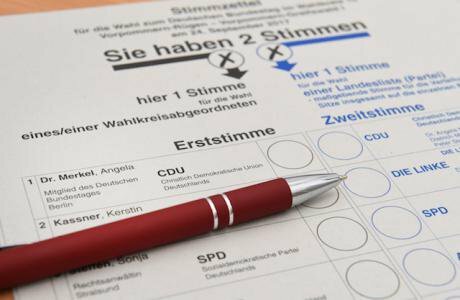 Most Germans want to be embedded in a democratic Europe. But at the same time, most German citizens fear that the price their country is being asked to pay for a democratic EU is one that Germany, however rich it may be, cannot afford. DiEM25’s European New Deal argues that this is not the case! Indeed, the price a majority of Germans are today paying for the lack of a functioning democracy at EU level is large, and wasted. To move beyond the politics of fear and despair in line with our European New Deal, German progressives should also discuss the idea of a constituent assembly process envisaged by DiEM25’s Manifesto that can open a broad social, political and cultural process towards a proper democratic European Constitution. Start a debate on the idea of a European constituent assembly process and of a Democratic European Constitution. German governments and industry have made great strides in producing and sponsoring renewables, recycling and Green practices. However, the key to the Green Transition that Europe and the planet needs is massive investment. And massive investment in the green technologies and processes of the future is impossible outside the macro-financial framework of a European New Deal agenda as outlined by DiEM25. Deepen and expand their commitment to the politics of a democratic social-ecological transformation by putting forward an agenda that combines austerity cancellation, financial sector regulation and green investment-led recovery, and which therefore could serve as a framework for this transformation. German industry prides itself on its technological progress. Nonetheless, when it comes to digital technologies, despite German industry’s expertise, Germany’s companies, society and government rely on Silicon Valley’s platforms in a manner that is harmful to technological sovereignty. Demonstrate to voters that Europe’s technological future cannot be left to German and American multinationals. Our economies and, indeed, our democracies depend on developing open source platforms that enhance our productivity and capacity to work together, without being exploited by the world’s latest form of monopoly power. Merkel’s initial positive reaction to the influx of Syrian refugees in the summer of 2015 has been vilified and classified as a spontaneous error. Her capitulation to ‘realpolitik’, and her despicable subsequent treaty with the Turkish President, has completed a nationalist and racist turn across Germany’s establishment. But civil society is resisting. Its resistance must be celebrated and reinforced! Take Merkel to task for having betrayed her own initial instinct to “let them in”. Put forward tangible policies that are true to the spirit of “let them in” and which spread across Europe a sensible, humanist and realistic approach – not only to refugees but also economic migrants. Aim to stop the EU-Turkey refugee deal. Merkel, after a recent meeting with President Trump, announced that Europe must take its fate in its hands and no longer “rely on the kindness of strangers” for its defence. This is correct. However, progressives should beware: we do not need a European substitute of NATO. We do not want a European pact spreading belligerence and weapons near and far. We do not want another shameful European intervention like in Libya in 2011. We do not want a European threat that gives Putin more excuses to clamp down on Russian democrats. Demand blocking the sale of weapons to repressive regimes, as many progressives already do. With worldwide arms sales up 7 per cent to €4.03 billion in the first half of 2016, Germany is responsible for conflicts around the world. With arms sales to Turkey, Saudi Arabia, the United Arab Emirates, Algeria and others, Germany is directly supporting repressive regimes and wars, which subsequently lead to migration and refugee crises. Fight for an Internationalist Europe that treats non-Europeans as ends-in-themselves. A Peaceful Europe committed to all efforts to de-escalate tensions in its East and in the Mediterranean, acting as a bulwark against the sirens of militarism and expansionism and proving its commitment by blocking the sale of weapons. An Open Europe that is alive to ideas, people and inspiration from all over the world, recognising fences and borders as signs of weakness spreading insecurity in the name of security. A Europe that finally acknowledges its responsibility for the historical crimes of colonialism and imperialism. A Liberated Europe where privilege, prejudice, deprivation and the threat of violence wither, allowing Europeans to be born into fewer stereotypical roles, to enjoy even chances to develop their potential, and to be free to choose more of their partners in life, work and society. So far the call has been signed by 83 candidates. Until September 23, their fellow candidates still have an opportunity to support our proposals and take part in our progressive list. 1. We demand the defense and strengthening of the social market economy and associated social achievements, as the economic model of the future. Therefore this should be promoted further at the European level in order to achieve social conditions for the market forces and a strong social policy. 2. We demand a European economic policy that takes into account that a common economic area cannot function if we constantly seek to undercut ourselves with taxes and wages and ‘flexibility’, treating solidarity in terms of self-interest. 3. We demand a European New Deal that involves large-scale investment in infrastructure and education, raising the German investment rate and having a pan-European upturn as its goal. 4.We demand the democratic elaboration of a European Constitution. A constitution that will strengthen our common democratic values, protecting and promoting freedom of assembly, transparency and solidarity. 5. We demand social-ecological transition, as we recognise man-made climate change and insist it is considered in political decision-making. 6. We demand a digital economy in Europe, therefore expanding the necessary infrastructure, giving citizens more control over their own data and encouraging open source development. 7. We demand a reasonable, humane and realistic migration and refugee policy, as well as an end to the EU-Turkey deal on refugees. 8. We demand an open, emancipated and peaceful Europe, which is internationally active for peace and which is conscious of our shared responsibilities to the world. A Europe which won’t export weapons to dictators and war-mongers. Other candidates who wish to be listed are asked to send an email to info@diem25.org by September 23.